Copies of photos that also appear in my Travel / Nepal gallery - see there for other photos of Kathamandhu and central Nepal. 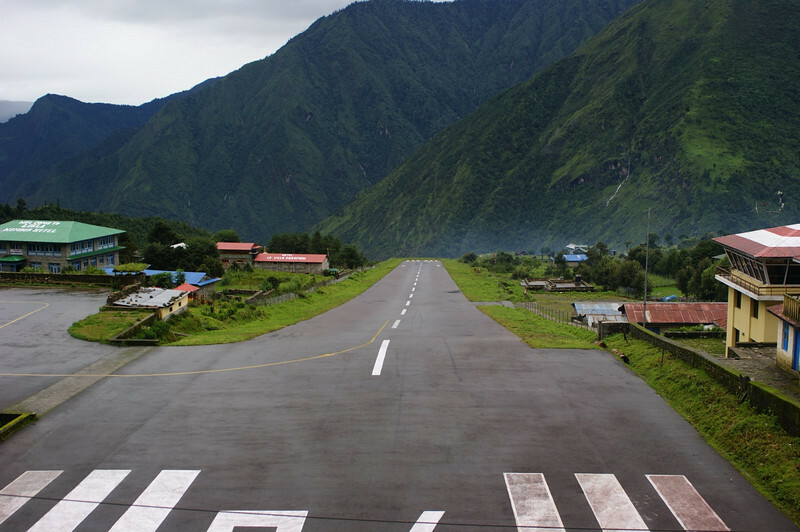 Lukla airport main runway. You may not get a full sense of the perspective from this photo, so I'll explain. The first 50 yds or so are flat. Then the runway slopes downhill at about 10 degrees till it suddenly plunges into empty space at the end. Landing is exciting. Taking off is sheer exhilaration - the plane turns at the very top of the runway to get all the distance it can. Then the engines rev and strain against the brakes. Finally the pilot releases the brakes and you hurtle down the slope as if it were a ski jump. The plane lifts off just before it runs out of tarmac (and ground) altogether. Then the wheels retract with a loud bang, and suddenly you are floating hundreds of metres over the deep gorge below.